Get free shipping worldwide on orders of $150 or more. Beauty Bakerie was founded in 2011 by Cashmere Nicole and has since grown into a powerful brand representing and empowering powerful people. Order your make-up products from Beauty Bakerie and trust in the quality, style and the fact that Beauty Bakerie products are cruelty-free! No. Online purchases from Beauty Bakerie must be returned via mail. Use the prepaid shipping label online and receive instant credit. Does Beauty Bakerie accept PayPal? Yes. Beauty Bakerie accepts PayPal at checkout as well as all other major credit card brands. Does Beauty Bakerie accept returns? Yes. Beauty Bakerie offers a 100% satisfaction guarantee on all purchases. Returns can be made within 15 days of purchase. Does Beauty Bakerie have a customer service phone number? Yes. You can call Beauty Bakerie customer service at 1(877) 335-2253, Monday-Friday 9am-5:30pm PST. Does Beauty Bakerie have any physical locations? Beauty Bakerie has one physical location in San Diego, California. Find Beauty Bakerie authorized dealers here or shop online! Does Beauty Bakerie ship to Canada? Yes. Beauty Bakerie will ship to Canada. Additional fees will apply. Does Beauty Bakerie test on animals? Nope. 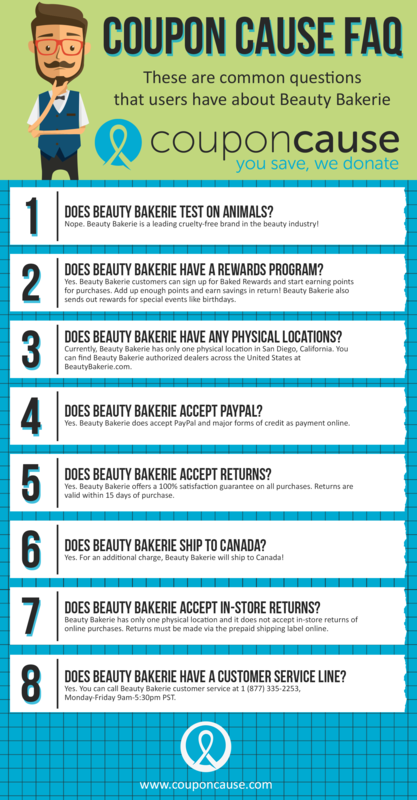 Beauty Bakerie is the industry's leading cruelty-free brand! Does Beauty Bakerie have a rewards program? Yes. Beauty Bakerie has the Baked Rewards programs which allows customers to accumulate points that can be redeemed for savings. Users also receive points for special events like birthdays or simply creating an account! Visit the Baked Rewards page for more info. Are you happy with the Beauty Bakerie offers on this page?